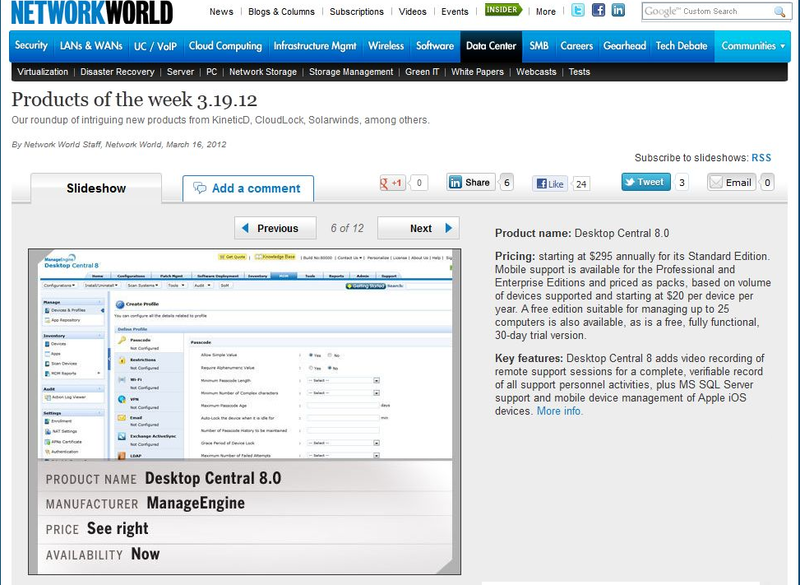 It is yet another milestone for Desktop Central to get listed as Product of the Week in Network World for the week of March 19, 2012. Network World is sought to be one of the best magazine in the networking industry that draws attention of network professionals world-wide. A listing here means a lot to us and we owe it to the product features, our focus on quality, customer-driven product enhancements, the value for money and our commitment to adapt ourselves to the emerging technologies. Desktop Central is an integrated Desktop Management software that provides Patch Management, Software Deployment, Asset Management, Software Metering, Software license Management, Remote Control, Configurations, Tools and Reports. Its integration with ITIL ServiceDesk Plus enables enterprises to perform Service Operations from within ServiceDesk Plus console. Desktop Central has now also added Mobile Device Management capability to its portfolio.